I took my Pulse apart in 2004 and I can tell you one thing...........it takes alot less time to pull off the body then it does to fix everything....and then remember how to put it back together again. First, I would remove the front tire and all the rear body panels and then pull the engine. Having the extra weight sitting in the garage somewhere and not on the Pulse, makes the job alot easier. Remove canopy, all the interior parts, wiring, disconnect cables and pull up the carpet. Remove front windshield and dash cover so you can get at the steering/front suspension. Remove the outriggers, so when you begin hoisting or jacking the Pulse you don't stress the outrigger steel or fiberglass components. 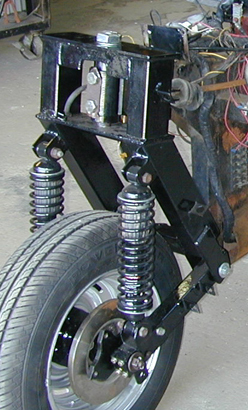 Once they are removed you can prepare to remove the front suspension. Disconnect the speedometer cable and front brake lines, now make sure you have either the Pulse supported by a hoist on top or use a floor jack with some wood/carpet underneath. The odds are you won't be able to lift the body, so the front suspension assembly can come out in one piece. 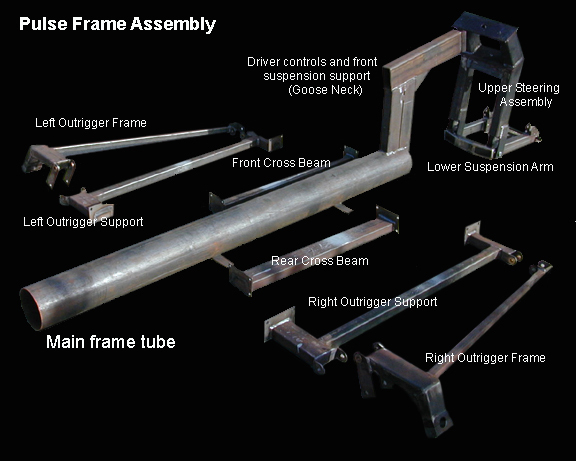 Now you can remove the 2 rather manly sized bolts that bolt the front steering assembly to the main frame "goose neck". Be careful, because that front suspension is quite heavy, even with the wheel removed and it can do some substantial damage to the Pulse or you, if you don't have it supported in some way, when you remove those bolts. The Pulse has frame cross braces (the rectangular steel tubes you bolt the seats to) and sometimes they are so badly rusted that you may have to cut things apart. If you can unbolt them from the outrigger supports (the pieces that have been "foamed" into the sides of the Pulse), you may be able to slip the body off with out removing the outrigger support. There's 4 bolts underneath the Pulse that hold the body to the frame and 4 bolts up by the steering assembly. Finally, the body should slide forward and off the frame. Obviously, whether you use a hoist or support/jack underneath, you are either pulling the body off the Pulse..... or the frame out of the Pulse body. Let me emphasize.... this is a condensed version of the task at hand. I'm planning on making a video of the process once I get the main body mold complete.